Because of my day job I have set holidays. I get 2 weeks at Christmas, 2 weeks at Spring Break and 2 months off during the summer. When I have time off I like to take off with my family. Here are 6 Reasons to Take a Family Vacation. Your kids will talk about that camping trip or that visit to the zoo for years after you’ve done it. Most importantly, they will remember that they did it with YOU. Yes, kids learn a lot from textbooks but there is no better to teach them about a culture then immersing them in it. Who doesn’t like taking a road trip or flying somewhere? Getting there alone is part of the trip and can be so much fun. There is no better time to re-connect as a family (and disconnect from computers, TVs and more) then when you are on holidays. Major family bonding happens when you’re away. I will never forget the first time my daughter saw Mickey Mouse or Princess Ariel in person. Seeing the expression on my children’s faces makes my heart feel so happy. Yes, we all love our home but sometimes staying in a hotel or condo is just what you need to switch things up (and appreciate what you have). Waking up to a different view for a week is worth it’s weight in gold. Taking a well planned family vacation can be a huge de-stresser! I’ve always said, everyone is happy when they are at the beach, relaxing, swimming and having fun. There is nothing better for the soul than experiencing this together as a family. Wether it’s small trips or big adventures, family vacations are extremely important and valuable. Vacations can show your children amazing spots in our big world, create endless memories and make you feel closer than ever. I’d love to know, do you have a vacation planned soon? What reason do you travel as a family? wonderful post on family vacations. I strongly agree with all of this! My oldest still asks to go back to San Diego. We’ll have to take him somewhere new soon! We have never taken a family vacation together. My daughters are 13, 12, 10, 3 & 2. We are on a single income as well while I am a stay at home Mom to the little ones so it’s difficult to save for a trip. We are hoping to do so one day, maybe by summer 2017 as there are so many great reasons to take a family trip together! We don’t travel nearly enough….hoping that changes soon as we’ve been talking about heading west to visit family! We are planning to go to Cuba next year. I think it’s important to get away from the rush and spend that time as a family. I find weekends are so full of projects and errands that we don’t often get to just enjoy the time together! We have an annual trip up to Parksville on the Island! Its far enough away to feel far away and its just so beautiful and peaceful up there! Great post! ps. Is that Cadbora Bay in the pic? Normally we just take our holidays to see family in alberta. But we are planning an extended vacation to Guatemala. And i just don’t know where to start. That sounds like an amazing trip D! Good luck planning it, I’m sure it will be so worth it. We haven’t been on vacation for so long I forget what it’s like to go anywhere, but it’s good to go and get out there, just to unwind and to reconnect with family, vacation it’s good for the soul!! I agree Lynda, vacations are so good for the soul. I hope you plan a vacation soon. Wether is close to home or a long flight away they are always fun. We didn’t plan one this year, but love family vacations for all of the reasons you mentioned! I’ve often thought of working for the airlines for the same reason Shannon! I wish I could go away every month. The memories and experience are important to me. 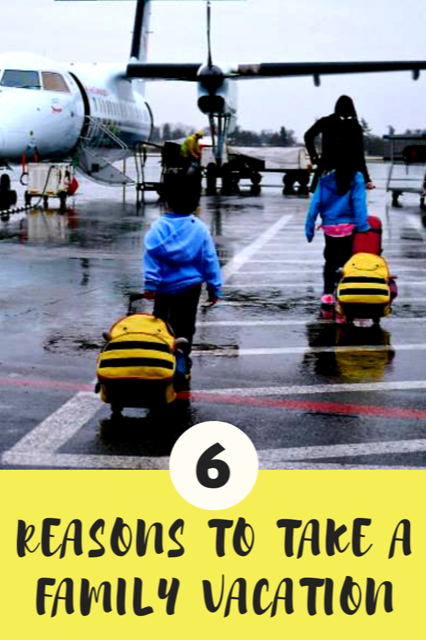 There are some things that kids can’t learn in school and travel really opens it up to them. Great article and family photos! We love going to the lake for a day at the beach! If only summer in Canada were longer! These are definitely great reasons to take a vacation with family. We love to this every summer. We have a grand vacation planned next week. How exciting OurFamilyWorld! I hope you have an amazing vacation! Love that picture of you walking onto the plane! So cute. 🙂 We’ve only done small vacations for the last few years, but the girls still talk about our big Mexican cruise a couple years back. We’re hoping to do something like that again in a year or so. 🙂 Thanks for sharing! Small vacations are so valuable too Bonnie. We love every and any vacation we take.